This is a nice, no frills, straight forward toaster. Had the same model that I bought several years ago when Marshall Field's department store was still in business & it proved to be reliable. This updated model is nicer in that it has a slimmer profile; hoping this one lasts as long as the previous model. 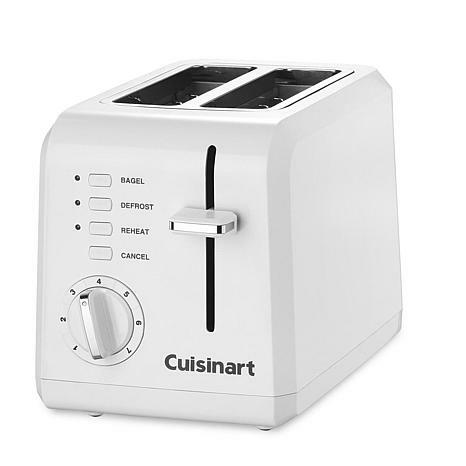 When you just want a toaster that works well and aren't interested in a million bells and whistles, then this is the toaster for you! Great product. Compact and saves counter space. I would recommend it to anyone thinking of purchasing one. Also the items toasted come out great! 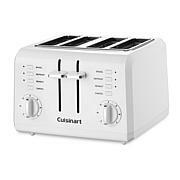 This toaster is made very well, It is not a light weight at all,very compact,I love it!! 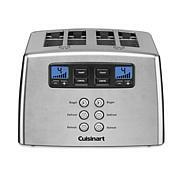 Been comparing toasters for a while, features and price. 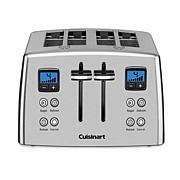 Came across this Cuisinart one for a realgreat price. It had the features I wanted,. It arrived ahead of scheduled and we have been using it for about 2 weeks, Took a small amount of time to determine the toasting # and it is pretty precise. I use the bagle, and frozen preheat cycle a lot. I REALLY like the lift feature, no more toated fingers when I do mini bagles. Be a one-plate wonder. 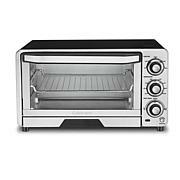 Brown it, bake it and percolate it every morning in one spot on the countertop with a breakfast center that has all of the trappings for your taste buds. They might not know your secret for whipping up that two eggs, toast and coffee so fast. But they know it sure tastes good.